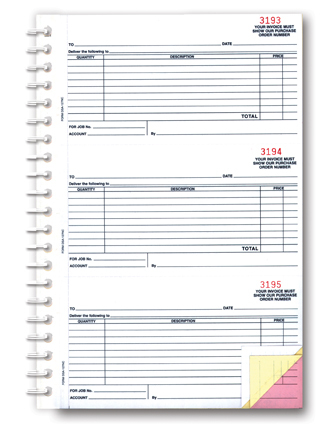 Coil bound Purchase Order Book include a heavy stock cover to prevent write-through. Size is 7-1/2" x 11". 3-part, 150/book (3-2/3" x 6-1/2"). Carbonless - White, Canary and Pink. Prints in Black ink with Red numbering (no selection of starting number). 3 P.O. 's per page. Packaged 1 book.